Anyone who has begun a fitness journey knows about obstacles. Those obstacles may include a health condition, an old injury, a stressful job, a busy lifestyle, a family tragedy, or anything else that might have prevented you for focusing on your health and well-being. These situations can be like big boulders on the path towards a healthier lifestyle. You either have to remove them from the path, find a way around them, or tackle them head-on. Either way, we're here to cheer you on! Speaking of cheering--and obstacles--we'd like to introduce you to two members of our Rocklin club, Roger and Tracy. We'd like to give them a big shout out for the progress they've made on their fitness journey, and let them share how they overcame their obstacles. Tracey explains how they got started, "When we walked into CFF over a year ago, we were overweight, out of shape and apprehensive. We had researched other gyms, but felt that CFF had everything we were looking for." "Roger had not picked up weights in over 10 years due to physical and emotional obstacles stemming from two life-threatening events: a bad motorcycle accident and a near-fatal heart condition," his wife, Tracy, explains. He found the specialized equipment and machines at Cal Fit enabled him to push past the pain and achieve the health goals he set for himself. Now physically stronger and healthier, he feels he can do so much more than he used to. His friends and family tell him he’s back to his old self. Sharing her own story, Tracy continues, "Years of being overweight and stressed out had made me tired, unhealthy and unhappy. I had never stepped foot in a gym and was quite frankly scared." Thanks to support from her husband, Roger, and Cal Fit staff, Tracy soon found her direction and began to work out regularly. "Now I’ve lost 45 pounds and can’t believe how much better I look and feel," Tracy notes. "The only 'drawback' is all the new clothes I’ve had to buy!" 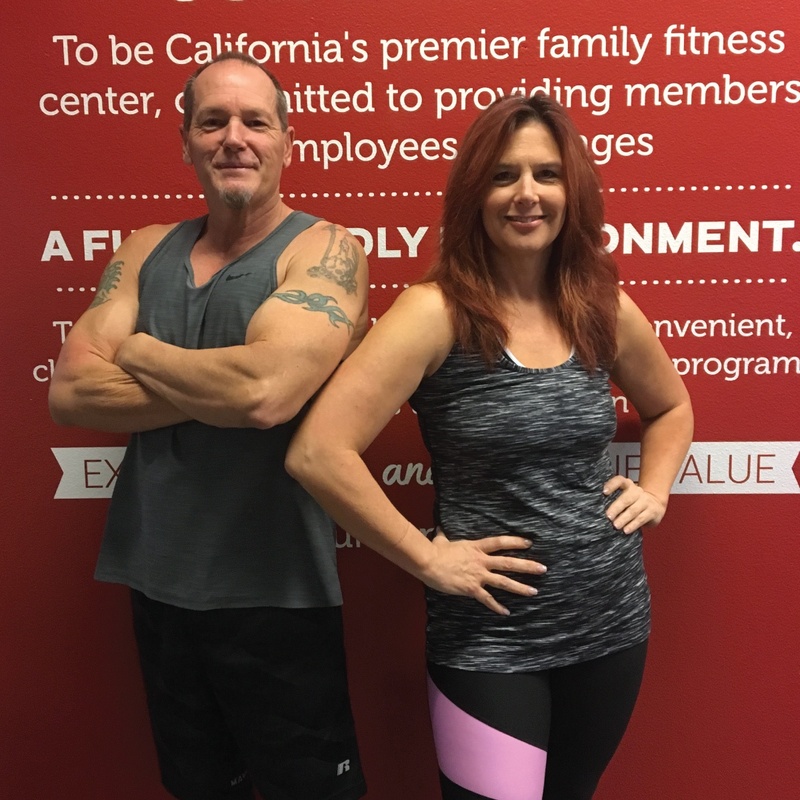 Tracy and Roger told us, "We both know that joining Cal Fit is one of the smartest things we ever did and we are so happy to be a part of the Cal Fit family." And we're happy you are part of the family, too! Thanks to Rodger and Tracy for sharing your journey with us. If you--like Tracy--are feeling nervous about entering a gym for the first time, we want to reassure you that you'll be among friends. Consider working out with a personal trainer a few times, or working out in a small group to help you get started. Everyone is welcome in our group fitness classes, where instructors can show you how to modify movement for your fitness level.